Villages Had Their Own Master Tailors. It's Time To Meet Yours. Today’s man often finds himself with very little time for keeping up with new fashion trends or spending hours shopping for new clothes. M2M Clothing recognizes these challenges and believes that building one’s wardrobe should be convenient, personal and enjoyable. Since our inception in 2007, M2M Clothing has provided the communities of the Greater Toronto Area with wide ranges of fully-canvassed, bespoke suits, jackets, pants, shirts, overcoats, trench coats, shoes and jeans. Using the finest fabrics from across the world, we are committed to providing the highest quality in hand craftsmanship for an unprecedented value (see pricing and options below). Any man would embrace the opportunity to own custom made clothing, designed and constructed specifically for him. Unfortunately, many believe that such a luxury is out of their reach. While this may have been true for many years, M2M Clothing now makes this once-thought unattainable luxury affordable for any man. We will schedule your personal fitting at the most convenient time and location that suits you. We are proud to be the first bespoke clothier offering custom made clothing designed and constructed specially for her. Our shopping experience for ladies is enjoyable and convenient. M2M Clothing provides the communities of the Greater Toronto Area with a wide range of fully-canvassed, bespoke suits, jackets, pants, skirts, jeans, shirts, overcoats and trench coats. Using the finest fabrics from across the world, we are committed to providing the highest quality in hand craftsmanship for an unprecedented value (see pricing and options below). 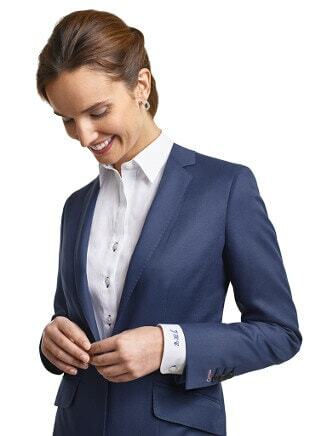 Change the way you buy your suits, shirts and jackets and enjoy it. Give us a call. We'd love to answer your questions or arrange for a personal consultation, at anytime, anywhere that is convenient for you. M2M Clothing provides both men and women with a wide range of custom made and individually designed suits, sport coats, pants, skirts, dress shirts, topcoats, trench coats, tuxedos, shoes and jeans. Your Personal Clothier will come and meet you at the most convenient time and location. We'll help select the perfect attire for your business, casual, social and formal needs - choosing from hundreds of cloths and a wide array of features and options. Using a pattern that is solely and exclusively crafted for you, our tailors will hand make your garments to into a sartorial masterpiece that will truly bespoken for. In a few short weeks your Clothier hand delivers your custom order for a final try-on, marking any final alterations that may be needed. A+ to the Quality and Service – Great Company!! Excellent service, product knowledge, and quality! 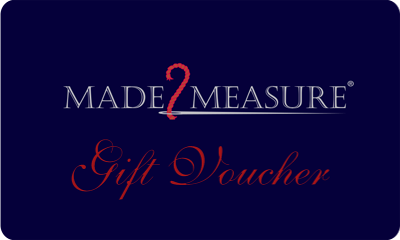 The M2M Gift Voucher is "The perfect gift to suit you." We have style consultants ready to book your private fitting. 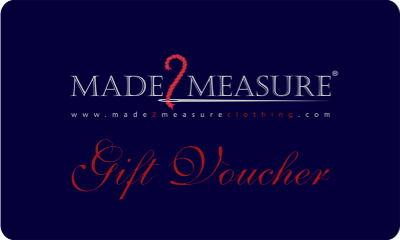 At M2M, we’ve spent our careers ensuring the Bespoke tailoring process is not lost. With our rich European heritage, we’re turning back the clock to a time when a great tailor didn’t need advertising yet his suits were one of the best-kept secrets in the fashion world. Website Design by Wiretree Toronto .